(Nanowerk News) About five years ago, Professor Janet Sawicki at the Lankenau Institute in Pennsylvania read an article about nanoparticles developed by MIT’s Robert Langer for gene therapy, the insertion of genes into living cells for the treatment of disease. Sawicki was working on treating ovarian cancer by delivering — through viruses — the gene for the diphtheria toxin, which kills tumor cells. After reading about the nanoparticles, Sawicki e-mailed Langer, an MIT Institute Professor and chemical engineer, to inquire about launching a gene therapy project with the nanoparticles. “I thought they would be perfect for what I was trying to do,” she recalls. The resulting collaboration has led to a promising potential treatment for ovarian cancer, one of the deadliest forms of cancer. This summer, the two laboratories reported that the nanoparticle-delivered gene therapy successfully suppressed ovarian tumor growth in mice. The nanoparticles, made of biodegradable polymers, offer a chance to overcome one of the biggest obstacles to realizing the promise of gene therapy: The viruses often used to carry genes into the body can endanger patients. Furthermore, the particles created in Langer’s lab now rival viruses’ efficiency at delivering their DNA payload. More tests are needed to confirm the particles’ safety in humans, but because they are synthetic, there is less chance that they will provoke a harmful immune response, says Daniel Anderson, a research scientist in Langer’s lab. There are nearly 1,000 clinical trials under way in the United States involving gene therapy, for diseases including cancer, cardiovascular disease and neurological disorders. However, no gene therapy treatments have been approved in the United States. Viruses, the most commonly used gene delivery vehicle, are a logical choice, since viruses are built to inject their own DNA into host cells. But after the 1999 death of a high school student enrolled in a gene therapy trial at the University of Pennsylvania, some researchers switched their focus to non-viral carriers. Anderson started the nanoparticle project in Langer’s lab about 10 years ago, shortly after finishing his PhD in bacterial DNA repair. Though Anderson found his thesis topic “scientifically interesting, it didn’t have a sense of immediate impact for me. I wanted to see if I could get closer to medicine.” He enlisted the help of chemist David Lynn, a postdoctoral fellow in Langer’s lab, now a professor at the University of Wisconsin, to build long chains of biodegradable polymers (large molecules composed of repeating subunits) known as poly(beta-amino esters). When these synthetic polymers are mixed with DNA, they spontaneously assemble to form nanoparticles. The polymer-DNA complex can act like an artificial virus, delivering functional DNA when injected into or near the targeted tissue. 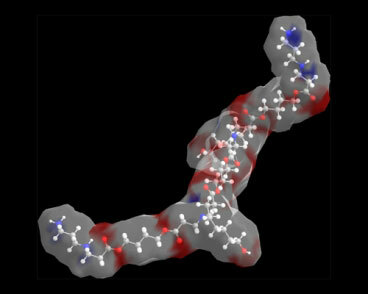 There are infinite possible sequences for such polymers, and small variations can make a polymer more or less efficient at delivering DNA. Anderson and others in Langer’s lab have developed a way to automate both the production of vast numbers of particles with slight variations and the screening techniques used to determine the particles’ effectiveness. “Instead of trying to make the perfect polymer, we make thousands,” says Anderson. That increases the odds that the researchers will hit on a nanoparticle that does what they want. “If you can try one or two things every six months, it might take a while to find something that works. But if you can try tens of thousands of things, your chances of success are much greater, and that’s true for any venue,” says Langer. One drawback to non-viral vectors is that they are not as efficient as viruses at integrating their DNA payload into the target cell’s genome, says Leaf Huang, professor in the School of Pharmacy at the University of North Carolina. However, in the past several years, advances by Langer and others have improved that efficiency by several orders of magnitude. Both viral and non-viral methods could eventually prove useful and safe, says gene therapy researcher Katherine High, who is part of a team that recently used viral gene therapy to restore some sight to children suffering from a congenital retinal disease. “It’s been a slow road,” says High, a professor at the University of Pennsylvania Medical School, but over the past 20 years scientists have made much progress in managing the safety issues posed by viral vectors. The ovarian cancer treatment developed at MIT and the Lankenau Institute has been successful in animal studies but is not yet ready for clinical trials. Such trials could get under way in a year or two, says Anderson. Meanwhile, he and others in Langer’s lab are exploring other uses for their nanoparticles. Last month, the researchers reported using the particles to boost stem cells’ ability to regenerate vascular tissue (such as blood vessels) by equipping them with genes that produce extra growth factors. “We’ve had success with gene delivery using these nanoparticles, so we thought they might be a safer, temporary way to modify stem cells,” says Anderson.